Yesterday my husband had the day off and we had our daughter's one year portraits and holiday family portraits done. 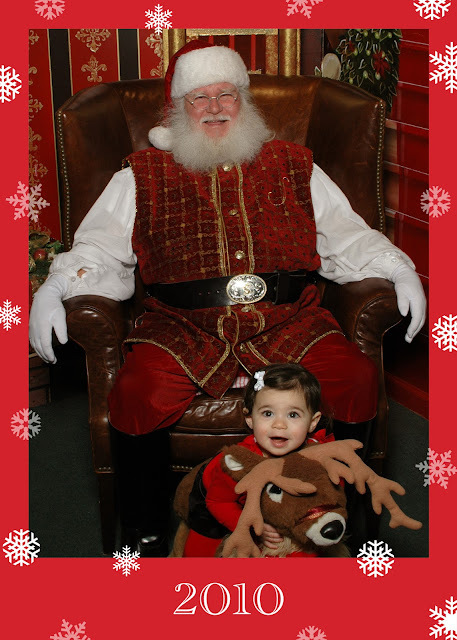 Amidst all this, since AJ was in such a good mood, we decided that we'd head over to the mall to visit with Santa Claus. The big jolly guy was happy to see AJ, but the feeling was not mutual! Upon sitting her upon his knee, she began to scream in fear. Not cry, just freak out and flail about. Santa's helpers were kind enough to whip out a reindeer looking ottoman for AJ to sit on cling to in front of Santa. Haha, I love this story. She is so precious! So adorable! I love the reindeer idea, what a good save! Great story and very cute photo! I'm following from the Product Review Place! Thanks for following me! This is so cute! I would never have guessed that she was freaking out moments before. She's so adorable!